Manfred von Richthofen made triplanes famous. His three-winger was a proper Fokker (yes, really), and in it he led the multi-coloured Red Baron’s Flying Circus through exploits of great derring do against the British in World War One. ow Ducati have introduced motorcycle grand prix racing’s first tri-plane, at Motegi last weekend. Already the winglets on the fairing flanks had sometimes appeared in biplane form; a small gap between upper and lower aerodynes contained within the same outside-edge end-plate. At Motegi, a third wing appeared – this one sprouting either side of the fairing’s nose, in the same style adopted at the previous Aragon round by Yamaha. Three wings on my wagon! 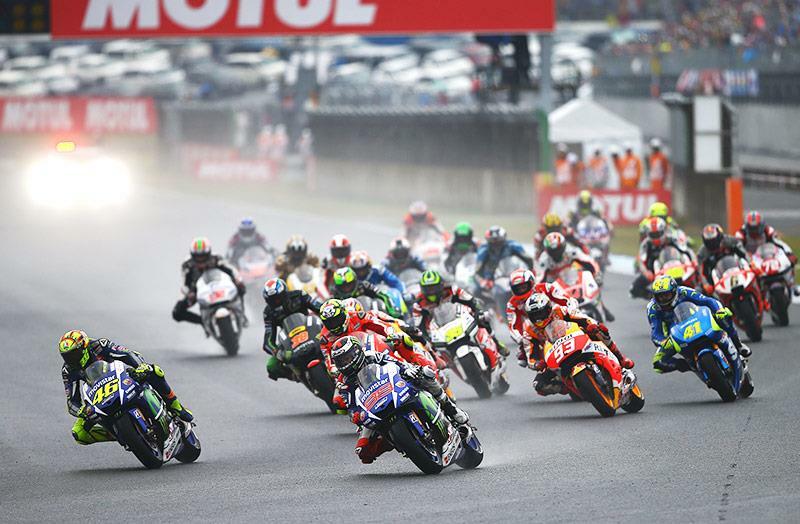 A jocular tone seems appropriate, for this was the line taken by the two Yamaha riders after a fascinatingly varied and rather surprising MotoGP race (this column has repeatedly recommended that all GPs should be attended by bad weather). Because there still seems to be an awful lot of doubt about exactly what the winglets do (exert a modicum of downforce at speed, apparently) and how this affects the motorcycle, especially when it is leaned over. Yamaha’s Massimo Meregalli admitted to Dorna’s TV crew that “the riders can feel a difference … but the lap time is the same”. 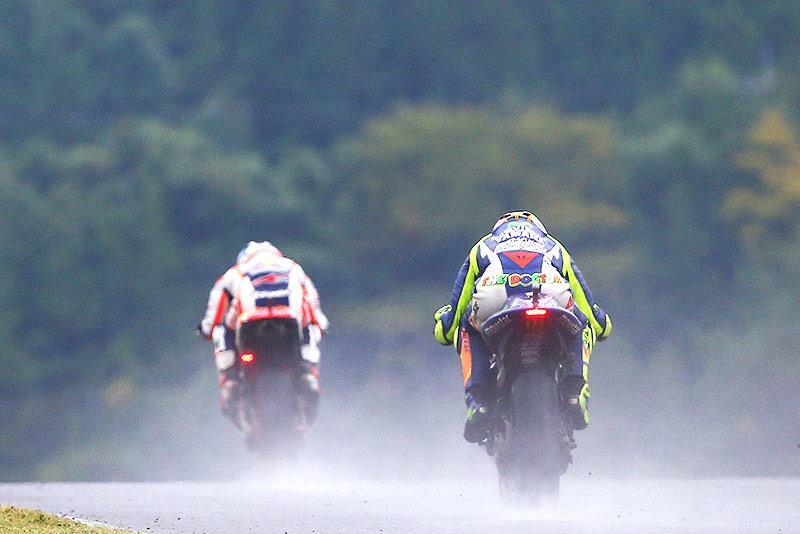 The Motegi race had started wet, but with a slowly but steadily drying line. This was particularly the case at the track’s hard braking areas, of which there are seven per lap, most of them (according to Brembo’s figures) subjecting bike and rider to 1.5G or more. Weight that all goes onto the front wheel. All the front guys used the same soft option front tyre; the difference between title rivals Jorge Lorenzo and Valentino Rossi was that the former (on pole position) used the winglets; Rossi didn’t. At the previous race, which Jorge won, it had been the other way around. Well, Jorge took off in familiar style, master of the fast wet lap as he had been in the dry, Rossi chased as best he could, some three seconds adrift. It looked like another text-book Lorenzo win, which would cut the old feller’s points lead back from 14 to nine, with three races to go. As we saw, from the edge of our sofas, it went the other way. Rossi left with his lead extended to 18. 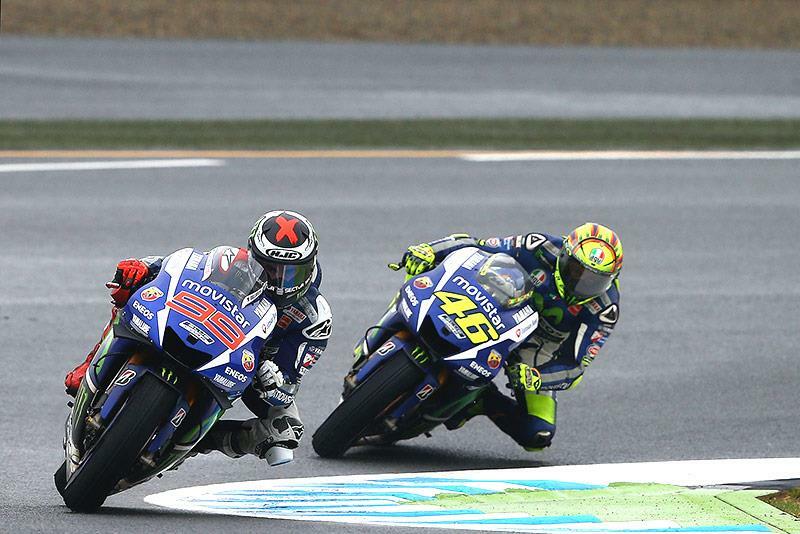 Both Yamaha riders had overworked their front tyres, both were slowing. Lorenzo’s early-laps runaway had overworked his even more: TV close-ups showed the Bridgestone shedding shreds of tread. Or was their another reason? Were his wings and their extra downforce punishing Lorenzo’s front more than on his team-mate’s otherwise identical M1? The riders’ response to the question was, as I said, jocular. Rossi laughingly asserted that the only reason he had beaten Jorge was because of the winglets. Jorge pointed out that so far they had always taken the opposite approach to one another. “Next race it is Vale’s turn again,” he said. The tyre wear had reversed their order on the track, but also prevented a Yamaha win. Dani Pedrosa had started (perhaps typically) with caution, and had earlier been resigned to a workaday fourth place. Only later in the race did the Repsol Honda underdog observe that while his lap times were still good, the two ahead were both slowing down. He was almost ten seconds adrift, but made short work of that to claim his first win of the year. Circumstances had handed him the tactics, he ended up looking like a genius. And what of the Red Baron and his Flying Circus? In fact neither of Ducati’s Andreas used the third wing in the race; but even with only a biplane Dovizioso’s tyres went earlier than anybody’s and he dropped from a strong third to a distant fifth. Iannone just broke down. Do these wings have any benefit at all? 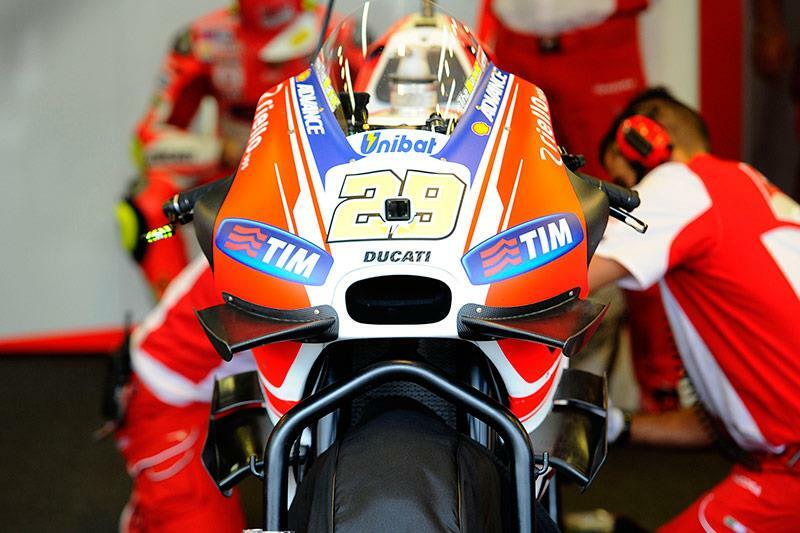 It seems that Ducati’s philosophy is becoming clearer: only by adding more and more of them will we ever find out. Can MotoGP’s first quadriplane be too far away?